Your workplace is a busy and productive place, so ensure you have signs that help keep it in order. Our Double Sided Workplace Signs help point visitors and employees in the right direction while also enforcing your workplace rules. Signs can be seen from down the hall in both directions, making it easy to find a designated smoking area or staff-only room. 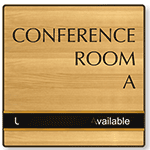 • Signs come with dimensional print for high visibility and are made to withstand daily use. • Brightly colored signs attract attention. 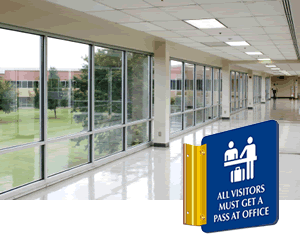 2-Sided Spot-a-Signs™ are a stylish addition to any hallway and are a great way to direct visitors. • Rounded corners and 3D appliqué make our signs unique, attractive and durable.